In it’s early days, the RKB had been stationed in Lord British’s Castle in Britain. After the mysterious disappearance of our King the Royal Knights were dispersed across the land in search of our lost Lord. 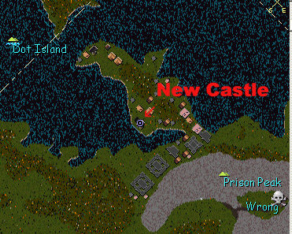 After a time, much of their force had regrouped and settled on the peninsula now known as Newcastle. Today the Royal Knights continue to serve the Royal family and protect all of Britannia as they await Lord British’s Return. 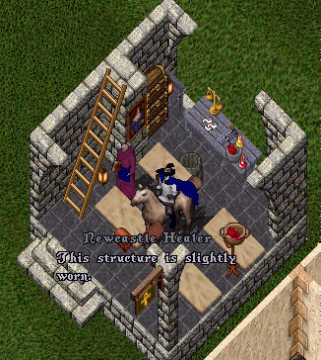 The western most building in the town of Newcastle is the private residence of an RKB member, Cerebus. This was the second town building acquired by the RKB. The Guild Hall is the original RKB stronghold in Newcastle. The building houses the guildstone and has messengers on duty to spread word of any news, information or upcoming events. 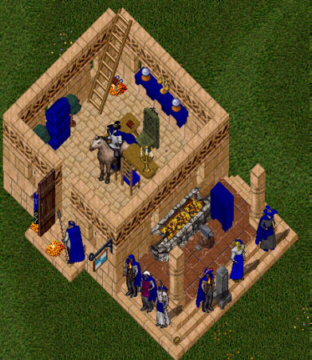 There are also several well-stocked vendors with items made by the Royal Craftsmen, or acquired by the adventurers while hunting. The roof of this Guild Hall holds several small rune libraries to places of interest, treasure spots and choice hunting grounds. 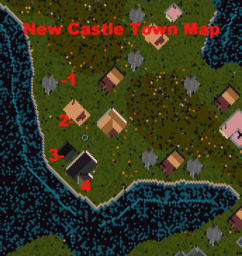 The Newcastle Healer is located just southeast of the Guild Hall. Here you will find an interesting assortment of tools, bandages and spare parts to be used on the warriors and mages who are injured during battle. This house of healing is maintained by Ariakas, whose brother Micah was devoted to the Virtues and “bandaging Britannia”. The Royal Oak Tavern is the jewel of Newcastle. The proprietor continually keeps the tavern up to date and inviting with rustic decorations, barkeeps and vendors. A great place to relax over a smooth ale and unwind after a perilous hunt. Upstairs you will find an extensive rune library to peruse at your leisure. 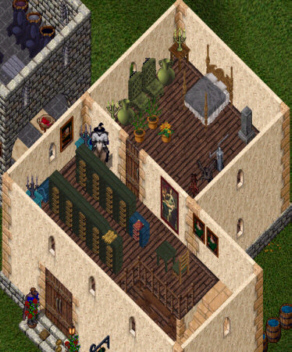 In keeping with the RP spirit, the Royal Oaks Tavern has it’s own forum on the RKB website where all are invited to tell their tales of adventure. Kyra’s Comments: When Rikus and I arrived at New Castle it was crawling with an impressive number of RKB members. They were informative, polite and have a wonderful little village going. I look forward to more events from RKB like the Virtue Tours! Rikus’ Remarks: My first experience with RKB and Newcastle was during the Virtue Tours event. Everyone who participated in that event was thoroughly impressed with the knowledge shared and wonderful environment that it provided to meet and converse while making new friends. Newcastle continues to foster such an environment most every night, so if you haven’t visited yet… Be sure to stop in and meet some of the nicest and most knowledgeable people in our realm.